1. 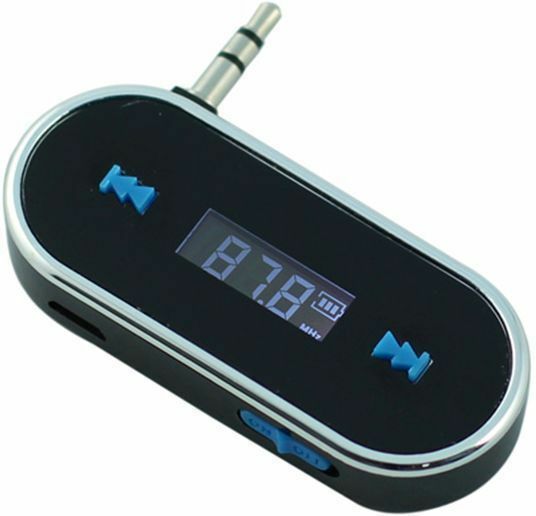 FM Transmitter for Mobile Phones, Tablet PC, MP3/ MP4 players, and other devices with a 3.5mm headphone socket. 2. Hands-free talking function offers you more safty during driving, clear and convenient to adjust the tuning frequency. 3. 3.5mm LCD displays frequency with blue backlight. 4. High Quality Stereo Sound. 5. With Touch key design, High fidelity stereo. 6. Digital PLL, transmisson is stable in different environments. 7. Full frenquency range. Memory for last frequency. 8. Powered by rechargeable built-in lithium battery,do not need to use the iPhone's power.